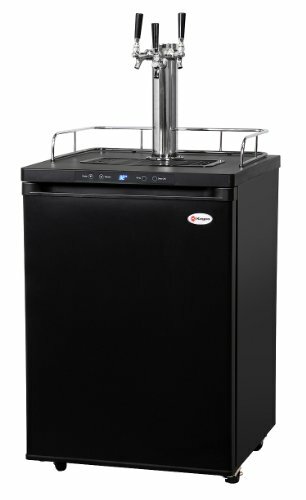 The Kegco HBK309B-3 Triple Faucet Home Brew Kegerator with Black Matte Finish adds digital functionality and a wider available temperature range to one of the best kegerators you can find. This kegerator is big enough to hold three 5 gallon home brew ball lock Cornelius kegs and comes with all the necessary draft beer equipment to dispense them. It still has all the features you've come to appreciate from other high quality Kegco models, such as attractive styling, a removable built-in drip tray that is easy to clean, a chrome guardrail that prevents mugs and glasses from sliding off the top and easy rolling casters. Now you have the ability to see your specific temperature setting and set it easily with the push of a button, in addition to having a wider available temperature range for more precise temperature control. The K309 has fan-forced cooling, giving it one of the coldest temperature ranges of any beer dispenser on the market today. 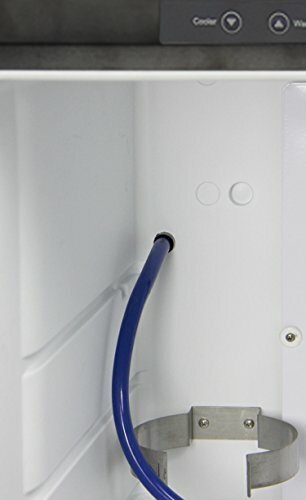 The fan helps provide even cooling throughout the unit. Temperature can be set as low as 32 degrees to dispense ice cold beer. The interior of this keg beer cooler is spacious enough to easily hold any full size keg, including Miller kegs, Coors Kegs, and rubber kegs. It comes with 2 adjustable shelves, allowing you to space them far enough apart to hold 2-liter bottles or gallon jugs. With the wide temperature range available on the K309, you can even use it to store wine!